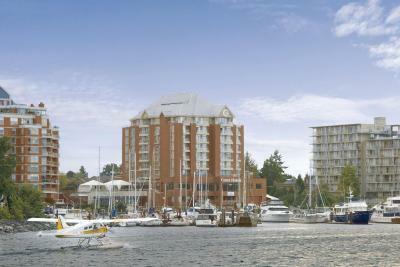 Lock in a great price for Coast Victoria Hotel & Marina by APA – rated 8.7 by recent guests! 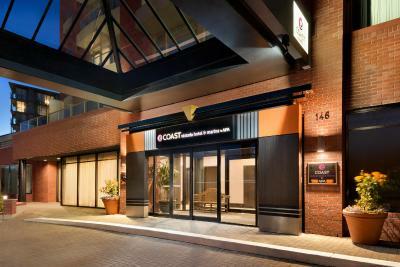 Rooms were very comfortable and staff was extremely friendly and helpful. The rooms are nicely laid out and very comfortable. 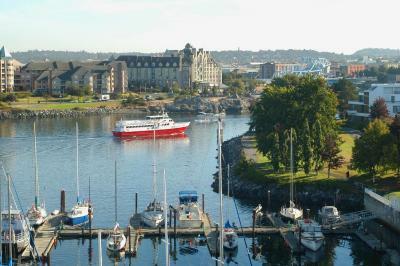 I had a gorgeous view of the harbour. All the staff were very friendly and helpful. I felt safe there. 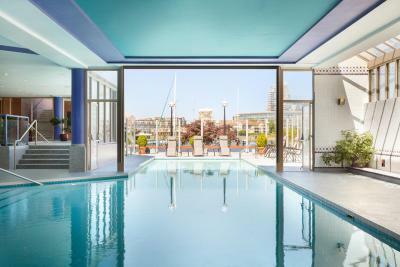 I also really enjoyed the indoor/outdoor pool. Beautiful ambiance and pool was nice, had a comfy bed and the view was beautiful. 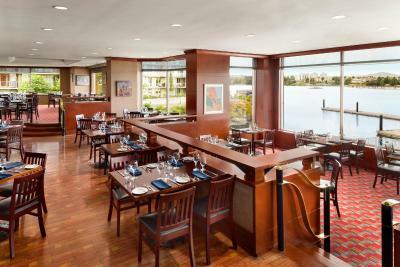 Great location on the ocean with a nice restaurant. I came to the hotel with my wife for my birthday and we had the best time. Everyone was nice and the room was great!!!! Perfect location! A short walk from the waterfront, restaurants and shopping -- but just far enough away to be away from the tourist crown and it was supremely quiet and serene. 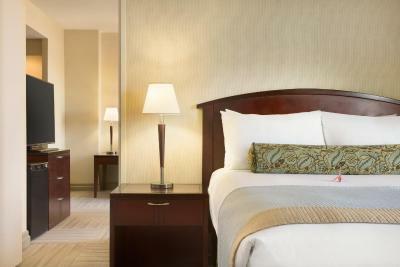 Very clean, modern and super comfortable rooms with lots of nice amenities! The views of the harbor were spectacular - esp. at night! We had a delightful dinner at the restaurant as well! I would definitely stay here again! Love it! 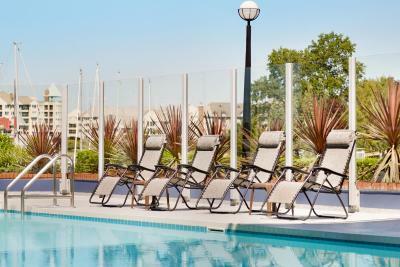 Exceptional staff, ambience, facilities (great swimming pool), and room with harbor view exceptional. Comfy bed which is always a plus. Also, loved, loved their shuttle service. Both Chris and Emilio were superb. 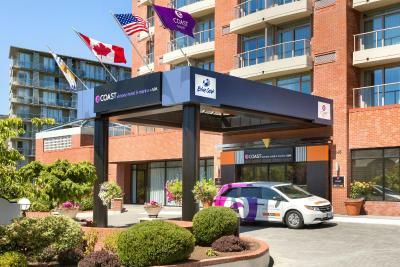 Coast Victoria Hotel & Marina by APA This rating is a reflection of how the property compares to the industry standard when it comes to price, facilities and services available. It's based on a self-evaluation by the property. Use this rating to help choose your stay! 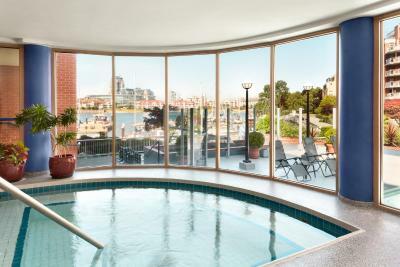 One of our top picks in Victoria.Featuring an indoor/outdoor pool and hot tub, this Victoria oceanfront hotel is located around the Inner Harbor, only 15 minutes' walk from the city center. 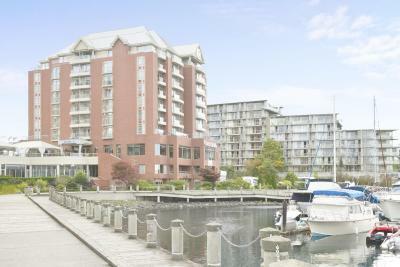 A full-service 52 slip marina is located on site. Free WiFi is available. A 55" LCD TV, on demand movies, coffee machine, and mini refrigerator are all provided in each room at Coast Victoria Hotel & Marina by APA. A work desk is available. 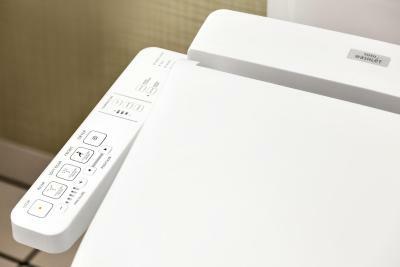 The private bathroom includes a hair dryer, free toiletries and a TOTO Washlet electric bidet seat. 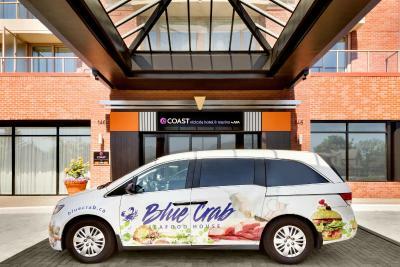 Guests can dine at The Blue Crab Seafood House on site. 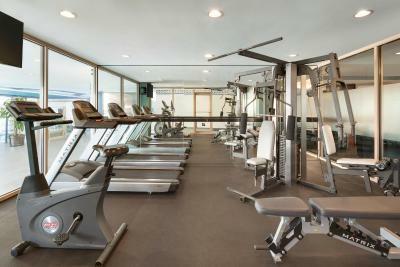 A fitness facility offers free weights, cardio machines, and sauna. A complimentary in-town shuttle service is available. A complimentary business center includes a computer, printer, and internet access. The Royal BC Museum is 0.6 mi from the property. 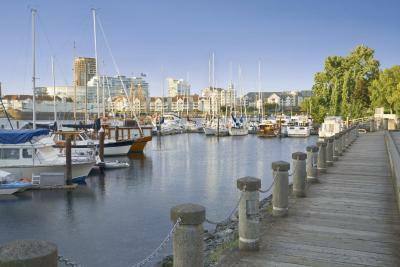 Beacon Hill Park is only 17 minutes' walk away. 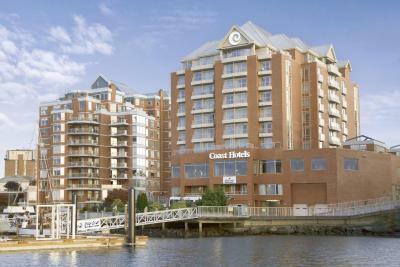 When would you like to stay at Coast Victoria Hotel & Marina by APA? Overlooking the James Bay residential area, this room features a juliet balcony. 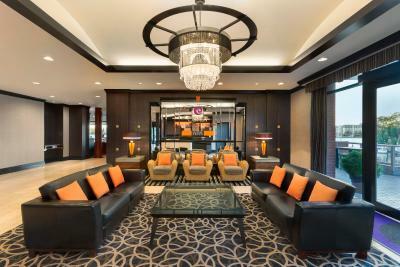 Complimentary WiFi, a 55" flat-screen TV and a desk are featured. A coffee machine is provided. Private parking is available on site (reservation is not possible) and costs CAD 18 per day. 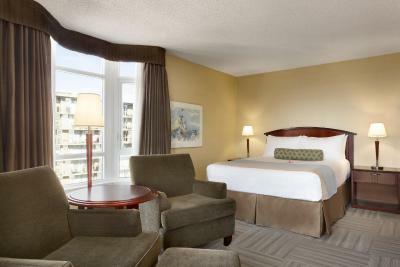 Overlooking the James Bay residential area, this room is located on a higher floor and features a juliet balcony. 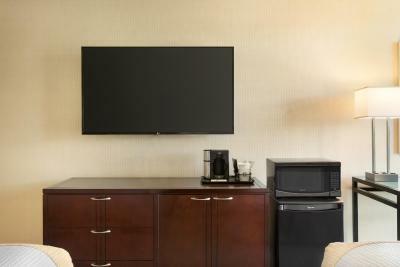 Complimentary WiFi, a 55" flat-screen TV and a desk are featured. 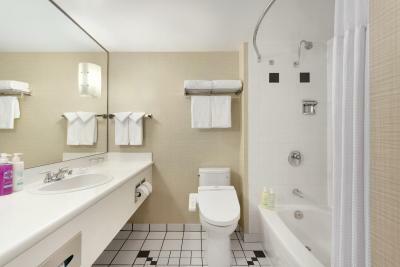 A private bathroom includes a walk-in shower, terry cloth bathrobes, and an enhanced toiletry package. 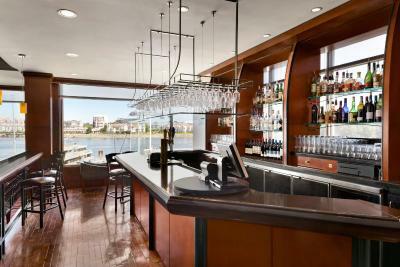 Overlooking the marina and harbor, this room features a juliet balcony. Complimentary WiFi, a 55" flat-screen TV and a desk are offered. A private bathroom includes a walk-in shower, terry cloth bathrobes, and an enhanced toiletry package. 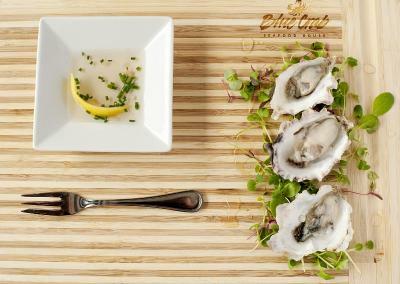 Rate includes a three course prix fixe dinner for 2 registered guests including gratuity in the Blue Crab Seafood House. 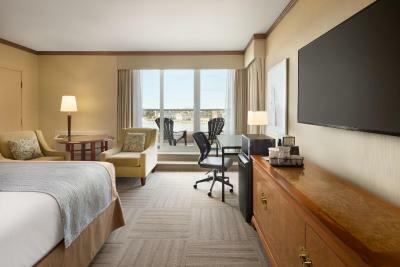 Overlooking the marina and harbor, this room features a juliet balcony. Complimentary WiFi, a 55" flat-screen TV and a desk are offered. A coffee machine is provided. Overlooking the James Bay residential area, this room is located on a higher floor and features a juliet balcony. 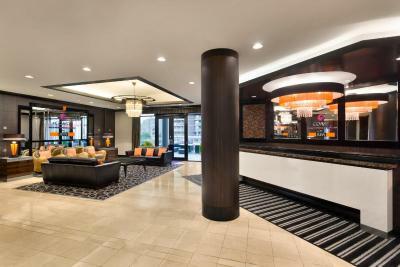 Complimentary Wi-Fi, a 55" flat-screen TV and a desk are featured. A coffee machine is provided. 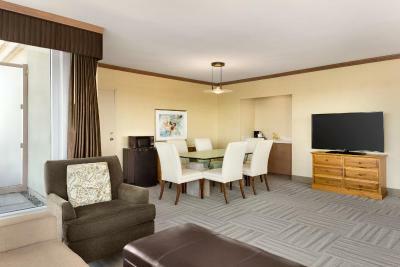 Overlooking the James Bay residential area, this room features a coffee machine. 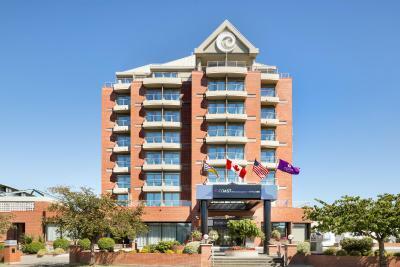 Complimentary WiFi, a 55" flat-screen TV and a desk are featured. Overlooking the James Bay residential area, this room is located on a higher floor and features a juliet balcony. 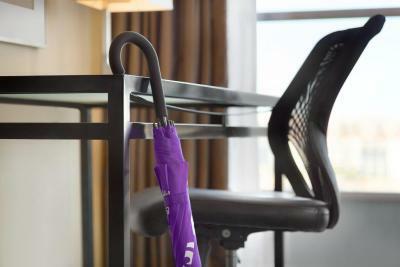 Complimentary WiFi, high-definition cable TV and a desk are featured. A private bathroom includes a walk-in shower, terry cloth bathrobes, and an enhanced toiletry package. 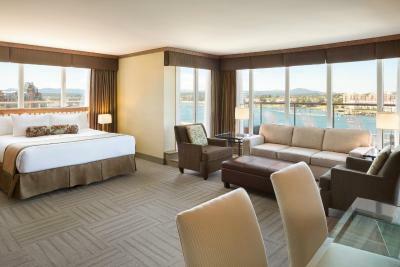 Overlooking the marina and harbor, this room features a juliet balcony. 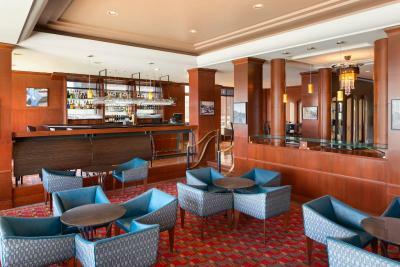 Complimentary WiFi, a 55" flat-screen TV and a desk are offered. A coffee machine is provided. A private bathroom includes a walk-in shower, terry cloth bathrobes, and an enhanced toiletry package. 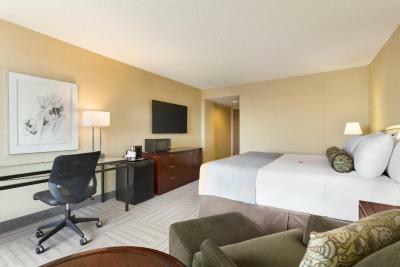 Featuring a 55" flat-screen TV, this accessible room includes a bathtub with grab bars and shower wand, transfer bench, roll-under sink, raised toilet seat and grab bars, reduced-height closet fittings, visual alarm and adapted security features. 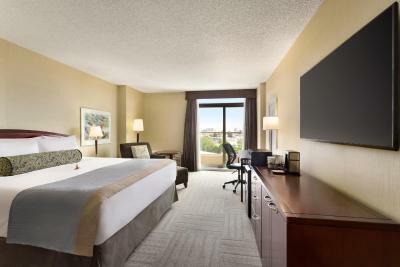 This spacious room offers a top-floor balcony with an expansive city view, a 55" flat-screen TV, a microwave, and a complimentary bottle of water. A private bathroom includes a walk-in shower, terry cloth bathrobes, and an enhanced toiletry package. Please note pets are not accepted in this room type. 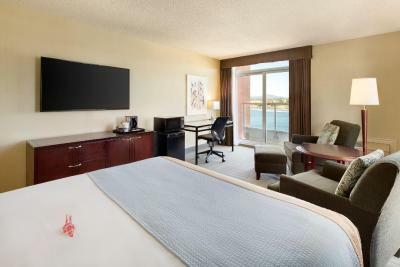 This spacious room offers a top-floor balcony with a water view, a 55" flat-screen TV, a microwave, and a complimentary bottle of water. A private bathroom includes a walk-in shower, terry cloth bathrobes, and an enhanced toiletry package. 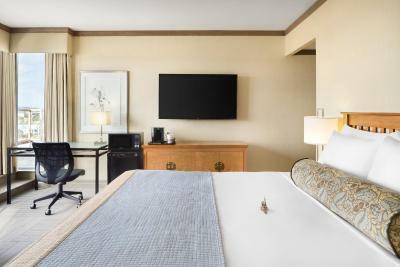 Featuring a 55" flat-screen TV, this suite offers a separate bedroom with a queen bed, a double sofa bed in the living room, and a top floor full balcony with expansive city views. Private bathrooms include terry cloth bathrobes and an enhanced toiletry package. A microwave and a complimentary bottle of water is provided. 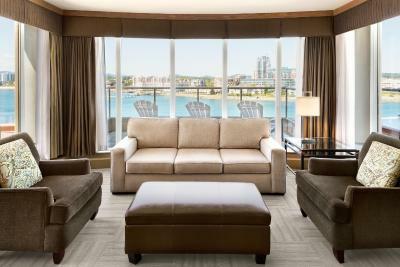 Featuring a 55" flat-screen TV, this suite offers an open-concept layout with a top-floor wrap around balcony with a water view and a dining table for 6. A private bathroom includes a walk-in shower, terry cloth bathrobes, and an enhanced toiletry package. A microwave and a complimentary bottle of water is provided. Victoria has a whole lot to offer, soak it all in our new Urban Style Hotel concept to the city at our Coast Victoria Hotel & Marina by APA. 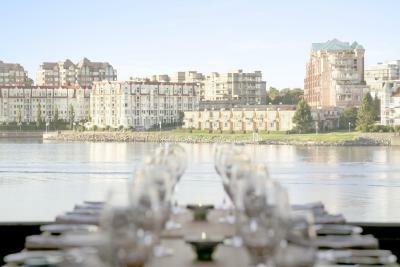 Our Victoria hotel features a spectacular oceanfront location, providing one of the most captivating views in the area – Letting guests soak in the natural beauty and historic splendor of Victoria, right from their hotel accommodations. 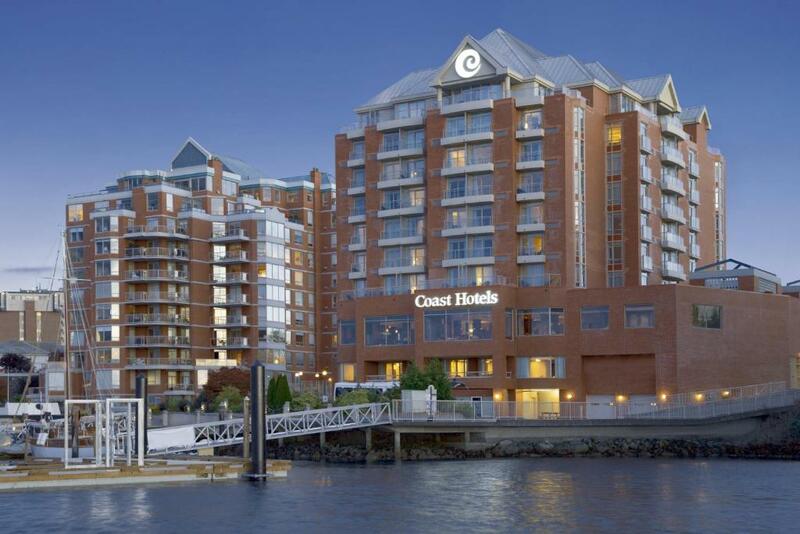 Our business hotel is situated on Victoria’s lively outer harbour, featuring a full-service 42-slip marina, award winning restaurant and gorgeous event spaces. 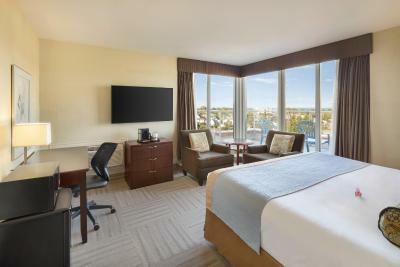 Each one of our well-appointed guest rooms & suites feature breathtaking harbor views, Electric Bidet Seat (TOTO® Washlet), 55” flat screen TVs and traditional welcoming origami cranes, a symbol of hospitality. 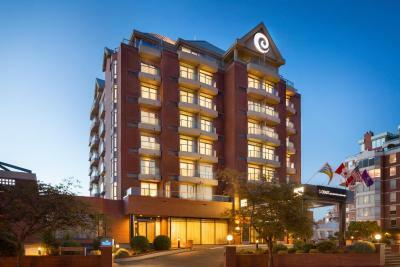 These high quality amenities are signature features of APA Hotel in Japan and unique to APA’s Urban Style Hotel concept. Our rooms come with complimentary wireless Internet and a range of modern amenities. Most offer Juliet or patio-style balconies. 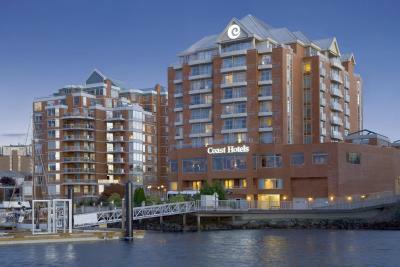 House Rules Coast Victoria Hotel & Marina by APA takes special requests – add in the next step! Coast Victoria Hotel &amp; Marina by APA accepts these cards and reserves the right to temporarily hold an amount prior to arrival. 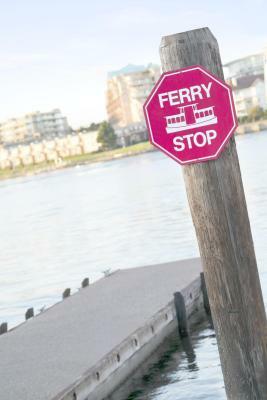 Coast Victoria Hotel & Marina by APA accepts these cards and reserves the right to temporarily hold an amount prior to arrival. Please note that none of the Premium Suites can accept pets. Close walk to everything in area. I paid for an upgrade to a king bed with view and it met expectations. The room was spacious. Although we chose to eat out, the fridge and microwave were nice options. The room was clean and the bed very comfortable. I liked pretty well everything except the parking. And I don’t have any suggestions about that. The bed was very comfortable and cozy. The view was excellent. 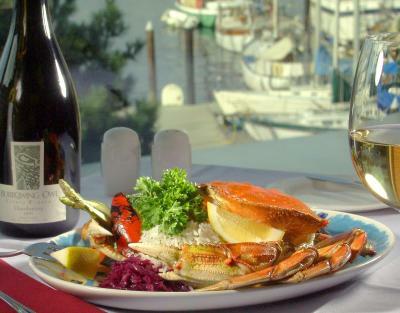 As I was there as a memorial time to celebrate my husband who died 6 years ago on that date, and who loved eating at the Blue Crab, it was a very nice place to stay. Your staff were particularly helpful and unobtrusive. I will be back again. The hash browns were cold the first day and the second day the ham had a bad taste. 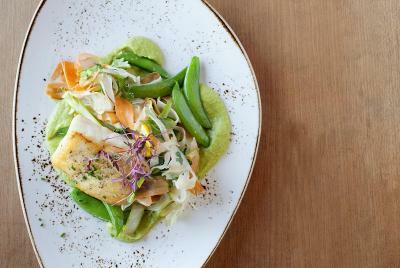 The restaurant seemed dated and the food was not as good as we had hoped it might be. Check-in was at three, but we were not able to use our room until 4:15. This was disappointing, but we were given coupons for the restaurant and free parking to make up for this inconvenience. The breakfast was in a lovely location over the water and marina. The service was good. The Housekeeping staff was very helpful and the pool and hot tub were lovely. The beds were very comfortable and the breakfast choices were delicious. I found the prices in the restaurant quite high. It would have been nice if there was a coffee shop or the like where one could obtain lower priced snacks or simple meals. Don't have anything to add to that, it was all good. It was very clean, quiet and very nice, but I was only there for one night. If I come back I will definitely stay here again. Thank you very much. Sound traveled through the rooms quite a bit, and we were woken early both days by the people next to us and above. 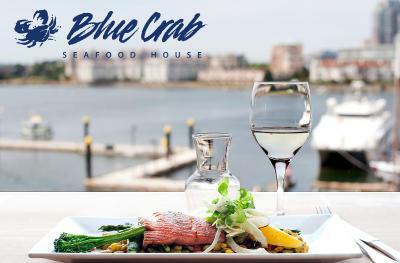 Breakfast was wonderful, we had a couple meals at blue crab, loved it! and cant beat the view! We could hear the next room's occupants.